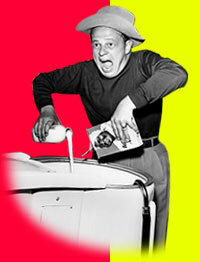 Madman Muntz - The Man, His Car, His Movie! The Sarasota Classic Car Museum has announced that on March 15, 2005, they will be unveiling an exciting new exhibit featuring a rare and beautifully restored Muntz Jet sports car. In conjunction with the opening of the exhibit, on March 17, there will be a private screening of the new feature-length documentary film, "Madman Muntz: American Maverick." The museum exhibit will include an original Muntz TV and other items associated with Earl "Madman" Muntz, one of the 20th century's most flamboyant entrepreneurs. In the 1940s, Muntz made millions as the world's highest volume used car dealer. He went on to produce the Muntz TV, the Muntz Jet automobile, and the Muntz Stereo-Pak. He is considered the founder of the car stereo industry. His private life was as exciting, and even more colorful, than his business career. He was a pal to movie stars, married seven beautiful women, and coined the term "TV." Not one to miss an advertising opportunity, he even named his daughter Tee Vee! The recently completed "Madman Muntz: American Maverick," directed by Dan Bunker and Judy ver Mehr, and executive produced by Sarasota resident James Castoro, is currently being entered into film festivals worldwide. The showing in Sarasota on March 17 is a private screening for invited guests of the museum. Members of the public will have the chance to be admitted free on a first come, first served basis to fill any remaining seats.